I search for the realness, the real feeling of a subject, all the texture around it…I always want to see the third dimension of something…I want to come alive with the object. Perhaps it’s my years spent working on old wooden boats but I too find myself drawn to these old, dilapidated structures that were once filled with life and now lie vacant, slowly returning to the ground upon which they were built. This particular barn stands fairly close to the edge of a road that I travel frequently and one could easily miss it as it sits sheltered by the trees that have grown up alongside it. It was a typical fall morning. The kind when the cold overnight temperatures have dropped a shroud of fog onto the landscape below. As the sun gained strength the light became quite soft and beautiful. The foliage had a deep saturated color and the nearby water shone with subtle reflections. For me it was an opportunity not to be missed. I love to use the in camera multiple exposure feature not to fill the outline of a person’s head with leaves as is more commonly seen, but to use it for more subtle qualities. 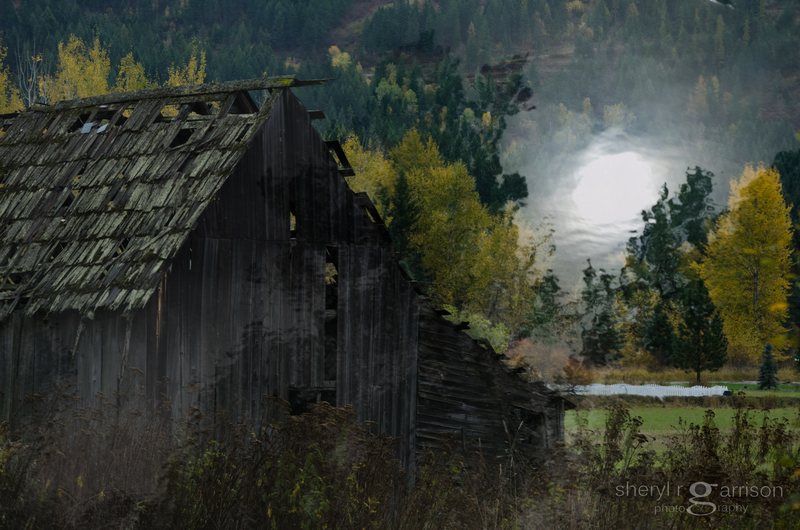 I love the painterly effects that it can imbue on an image and I hurried to paint this old barn with my camera. I will often return home from photographing with images that I did not plan on. Part of living an artistic life is being prepared to capture what is presented to you on a daily basis. Whatever your medium, carry at least part of it with you at all times and when you see a moment, you can react to it with spontaneity and make it come alive! So painterly, it’s crazy! I don’t know how you do it (even when you tell us how). What a collection these blogs make…a history of your efforts and thoughts. Thank you Jenny for always popping in and leaving such lovely comments. I so appreciate your words! You certainly made this scene come alive with your technique Sheryl! It does appear to be a beautiful painting…wow!